Mark Rozin/Capital Press Terry Harchenko, with Industrial Aviation Services, Inc., drops a bundle of Christmas trees at Lamb's Christmas Tree Farm outside of Mehama, Ore.
Low prices caused by an abundance of Christmas trees threaten to dampen the holiday season for Pacific Northwest Christmas tree growers. Still, growers said they are making the best of the situation by cutting costs where possible. Some are taking a little less money to ensure trees get sold. "What do you do?" asked Stan Low of Highland Farm in Beavercreek, Ore. "It's just a struggle. There is no easy answer to any of this." Christmas tree growers in the Northwest this year are facing the consequences of over-planting that occurred earlier this decade. "There are just too many trees out there," said Mark Steelhammer of KLM Tree Farm in Rochester, Wash.
"Customers know they can come back in later and buy trees, so they are lowballing the price," said Bryan Ostlund, executive secretary of the Pacific Northwest Christmas Tree Association. The good news, growers said, is markets seem to be holding, labor is plentiful, trucks are available and shipping costs are down slightly from a year ago. "I think we'll end up selling as many trees as in the past," Low said. "But the market is diluted." The recession could swing buyers to less expensive trees, but also could increase the number of trees sold: Families that normally travel at Christmas, might stay home this year, said Bob Schaefer of Noble Mountain Tree Farm in Salem. "That's the thought going in," Schaefer said. "But, of course, that remains to be seen." Market conditions also could prompt more growers to open fields to choose-and-cut, and could prompt growers to lower the U-cut prices to attract buyers. "I don't expect us to sell fewer trees than last year," Ostlund said, "and I wouldn't be surprised if we are up a little bit. "But the value will be off a little," he said. 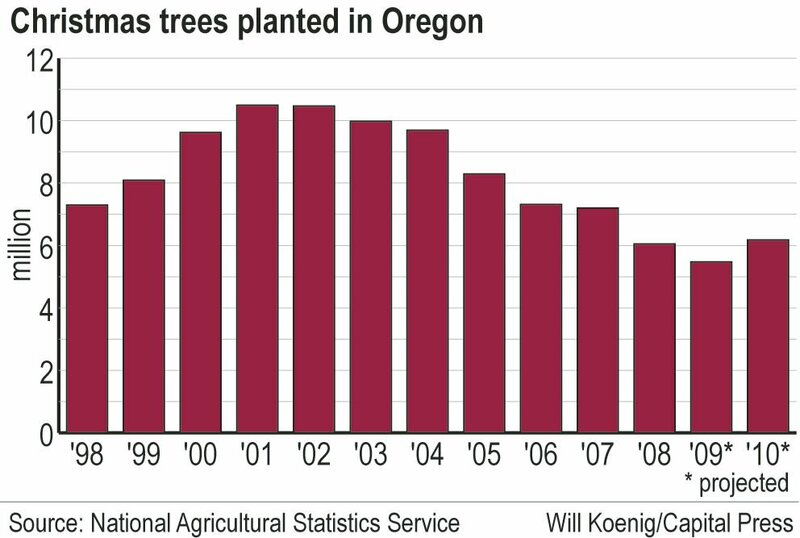 Surveys show Oregon growers in a five-year stretch beginning in 2000 annually planted around 10 million trees. The surveys show Oregon growers sold 7.3 million trees last year. Typically, about 80 percent of a planting makes it to harvest. "(Earlier this decade) everybody planted a tree on every square inch they could find," said Tom McNabb of Yule Tree Farms in Aurora, Ore. "Now today they're asking, why did we do that?" Christmas tree production in California and Idaho isn't expected to affect the U.S. market. Production in those states accounts for less than 1 percent of the U.S. production. The excess supply in the Northwest has led to a steady drop in price -- from an average of $15.62 per tree in 2005 to $15.01 last year. With buyers carrying short inventories and carrying less expensive trees this year, most expect the price to continue to drop. Still, some growers said they were holding firm on price and buyers were beginning to come back in at the higher price. "We held the line of price, and we're now getting several calls a day," Schaefer said. McNabb said Yule Tree also for the most part has held firm on price. "We're going to be just behind last year," he said, "but not significantly. We gave up a little in a couple of places to keep the market." Also good news, Ostlund said, is the future holds promise for growers who can survive the next couple of years. Surveys show the number of trees planted dropped off dramatically beginning in 2005, falling to less than 6,000 this year. By 2012, most expect trees to be at a premium. "We will have fewer trees eligible for harvest than what we sell," Ostlund said. "I think there definitely will be a shortage of Christmas trees in a couple of years," Steelhammer said.